Stew on NYC radio. On Italy. LONG ISLAND, NEW YORK – Everything you’ve ever wanted to know about Italy. In three easy pieces. Audio excerpts from an interview we did with a NYC radio station. The host, John Vivenzio found us on the web and called and asked if we would like to talk. About Italy? Ma Certo! The conversation ranged from the top of Italy’s boot to the bottom of her stylish toe. We talked about food, culture, restoring old, old houses, and making new friends. The only thing better than chatting about Italy? You guessed it: being there. All this talk has got us really ramped up for our September trip. So far the tentative itinerary is Panicale, Venice and the Brescia region in Italy. With side trips to Dubrovnik, Corfu, Santorini and Beyond. Sometimes you just get lucky. 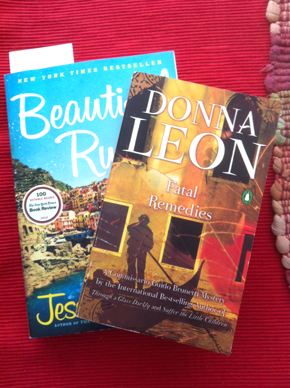 Getting ready to go on a flight down south I found not one, but two Donna Leon books. That I hadn’t read! They are not heavy reading, always set in Venice and perfect for a day at the beach or a day in the air. Guido, the police commissario, is so erudite and engaging, as is his family. And the author has many nice turns of the phrase. Well, I like the stories. Harmless entertainment. Particularly, when it happened in my own post-Joycean world. Go ahead, paint me a Philistine. I tried. I wanted to like old James. 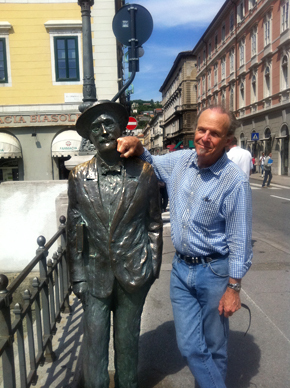 He and I both love Trieste. So, my first choice on our last flight was “Portrait of the Artist as a Young Man.” Written early in the century in Dublin and then started over and finished in Trieste, ten years later. Clearly Mr Joyce was miserable times seven when he initially wrote it. Hopefully, finishing it in Trieste, he was crying on the outside, on the pages of the manuscript but laughing it up on the inside, having survived and escaped Catholic boarding school in Ireland to sunny Trieste! Half way thru it I’m ready to break a Cardinal Red Rule which is “don’t brag on a book until its over.” Which is just what I’m doing. I like it a lot. It has complex, interesting characters, over laid with each other in surprising ways, lots of specific “voices,” just a myriad of things to like. I’m already plotting to try more of Jess Walter’s books. Speaking of books: What good books have you read lately? Either set in Italy or about Italy or by an Italian? 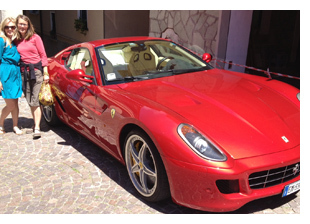 Anything, even marginally Italian-oriented, would be considered. If I get a lot of responses, I might like to share them here. Which will drive me to update my Favorite Italian Books List on the web site. See you in Italy! See you in Italy! 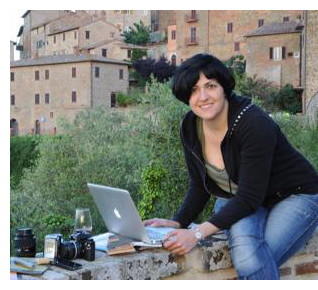 PANICALE, Umbria, Italy–New web site to send your way. From our very talented friend and Panicalese neighbor Diletta. This is in our neighborhood. In fact, our house is just above her in the photo . The site is brand new, a work in progress, the English version will be up shortly. Watch for that, but in the meantime there are plenty of fun photos and a sense of good things to come. Say you have a desperate need for saffron, fresh from Italy, well, this could be for you. Or olive oil, or many other things that help awake fond Italian Memories of all things Umbrian. NEW, NEW VITI TRASIMENO SITE. The site, for the moment, is all in Italian, but never fear, there are big pictures of the products and a link to email where you can write in English or Italian and ask Dily any questions you have about the products, about ordering. Her English is all inclusive, very fluent. Allora, ci sentiamo and in September we hope to . . .
TRIESTE/LAKE COMO, Italy–Our anniversary trip to Italy was grand. It was just too short. We had planned for three weeks but it became one. Best laid plans and all that. And seriously, who is going to pout about ONLY getting a week in Umbria / Italy in spring? Where would a person have to go to find a lot of sympathy for that?! Regardless, we were there in our minds. And our travel buddies from Steamboat Springs Stayed Calm and Carried On in marvelous fashion. And thru pictures and videos made us feel like we were actually right there with them, just as planned. 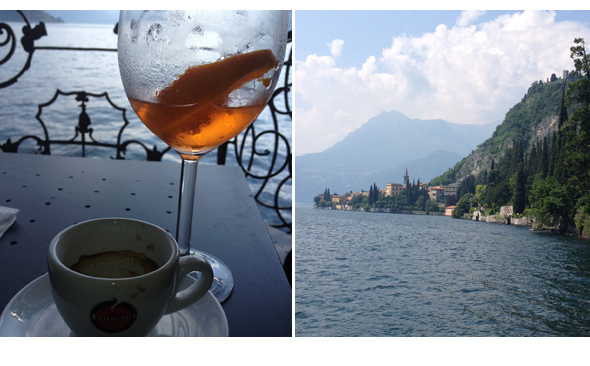 Which well and properly answers the age-old question “what are good friends for?” Their still photos of Italian lakes, Ferraris, and lazy afternoons shown here are from Varesse on Como. The video from Piazza Grande (now called Piazza Unita d’Italia) in Trieste. Trieste is about as far as you can go in Italy. East of Venice. A couple miles further out of town and you are in Slovenia. I’ve heard it said that Piazza Grande is the biggest piazza in Italy. It’s original name more famous by the classic Lucio Dalla song “PIAZZA GRANDE, 1943”. Three sides are elegant buildings. The fourth side is all Mediterranean, looking out past cruise boats, across the harbor at Emperor Maximilian and Carlotta’s fantasy castle, Miramar. NORTH AMERICAN APE PROVING-GROUNDS (NAAP), North Yarmouth, Maine–You might think you could feed one of these hearty Italian Apes almost anything. But it turns out corn-based ethanol gives it heartburn. Ask our friend Paul Turina of Turina Italian Wines. He and his wife Betty own the house in Panicale with us. We have so much in common. Betty, like original co-owner, Kiki before her, also works at the same office we do. Paul, on the other hand is a friend, client AND an Italian wine importer. And we drink wine! 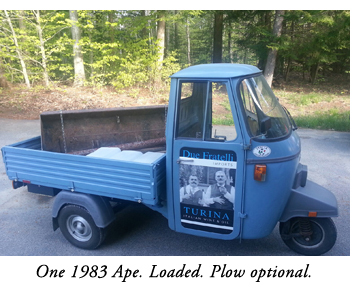 Plus, in addition to all that, Paul and I both have Vespa-based, Apecars. Those cunning, little three-wheeled, mini-pickups that you see all over Italy. Mine is somewhat gussied up, a bit of a prima donna. That cute girl friend that surprise, surprise, turned out to be a bit high maintenance. Its latest excuse to dodge work is that its insurance company thinks it’s a show car and shouldn’t get dirty. Paul’s on the other hand is a blue collar, hard working, sings for its supper kind of ape. It earns its keep by regularly hauling half tons of mulch, heating oil tanks, palettes of red and white wine, you name it, it hauls it. One day last week its load was the heavy metal plow blade of Paul’s tractor. They picked up our ace mechanic friend Peter and together they buzzed off down the road. Until, at a certain point, it got really quiet. Which is not an Ape’s natural state. Ape means “bee” in Italian (Vespa, fyi, means “wasp”) and they call them that because of the noise they make. So, when it went silent and forward motion tapered off, a warning flag went right up. Rolling it into Peter’s repair bay later, they surely stood around, scuffed their feet a bit, pushed their hats back, scratched their heads. And pondered. As guys will do. But, there’s always that one guy that just happened to drop by. That one guy, that–after the fact, thank you very much, knows exactly what you did wrong. “Yep” he said slapping his knee, “you pull that spark plug and shine your little light in there and you’ll see the top of your one and only piston has a hole burned right thru the top of it.” He went on to say he’d seen the same thing with older outboard engines. And much as anyone hated to admit it, the guy was right. Corn burns hotter and if not adjusted for, makes a big hole. See photo enclosed. Heavy sigh. 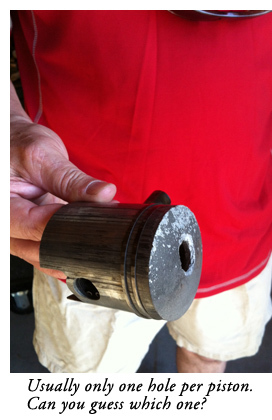 And no, its not a good thing, this hole in the top of your piston.The one on the side is fine. They tell me, that is for exhaust. So that was in the relatively good news column. The other good news is this only happens with big loads, long duration. And can be avoided with a revised carburetor setting. Paul says he will do this on mine as soon as he works out the details on his. Happy ending all around. And soon, the ape population in the Greater Gray/North Yarmouth Metro Area will be back up to full strength: Two. Copyright © 2019 Italian Properties. All rights reserved.